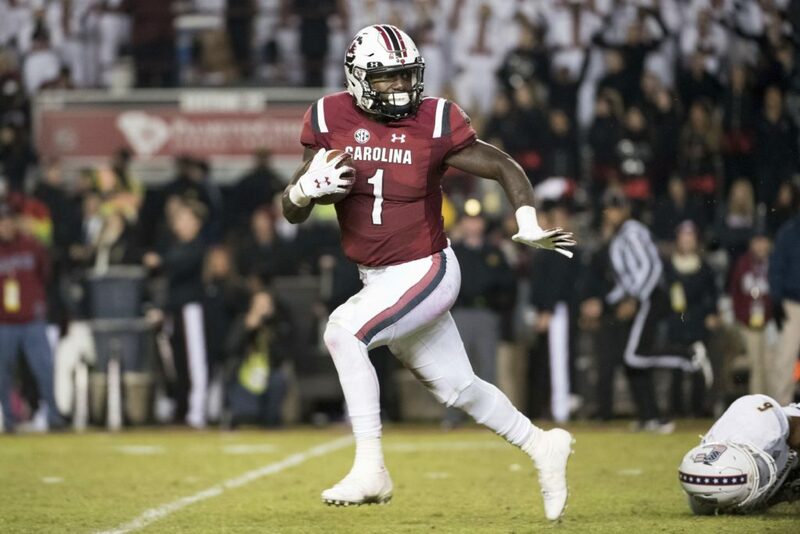 Check out my video breakdown of South Carolina wide receiver Deebo Samuel. Examining South Carolina WR Deebo Samuel’s fit as a flanker for the 49ers. JJ Arcega-Whiteside, Hakeem Butler, Parris Campbell and and Emmanuel Hall also look good to me. Good work Grant, hey if WR isn’t taken in rounds 1 and 2… 6’3″ WR Kelvin Harmon could be there at #67. Could you do a video on him?..thanks. Thanks, Neal. You got it. Grant, thanks for all the breakdowns. I went back and watched all of them back to back including Garcon; it was great how you let the film do the talking and just educated us novices on some of the finer points. After watching your film session I’m more convinced that we need to be aggressive and do whatever it takes to get AJ if he’s there past pick 25. We need to find a partner and get back in Round 1 to nab him, as he won’t be available at #36. Thanks for the great content as always my friend! I wonder if the QB had an effect on his catches. Manny Wilkins threw nice passes to NKH. Jake Bentley did not seem to be extremely accurate. Saw high, and late throws. I believe that you posted a comment on Hakeem Butler a couple of weeks or so ago. I may have missed it, but did you do a video breakdown on him? He’s another big WR who may garner interest. I would give Deebo a nod in the 3rd rd and beyond. I agree, GREAT job Grant.! !..Thanks for taking the time to do these breakdowns. H. Butler would be another good WR to see on film since he might be in the mix. Can you break down JJ Arcega-Whiteside? I’m loving these Grant, thank you. Safety would be another position I’d love to see broken down, unless you doubt we’ll draft one. Thanks. I’ll break down some safeties. Taylor Rapp, Chauncy Gardner-Johnson, Jonathan Abram and Juan Thornhill may all be available around 36. Hmmm, Nasir Adderly just fell 15, and is ranked 36. Many say receiver is the glaring need position at pick 36. I think defensive back is a bigger concern. But receiver, defensive back and offensive tackle (Staley won’t play forever) are all big enough need spots to justify at pick 36. On that note, I’ve talked a bit about Chauncey Gardner. Initially in the 2nd or 3rd. Lately I’m seeing him go in the first round in many mocks. It should be no surprise. – Has been a strict by the book role player. May have trouble improvising when a play break down. Chauncey Gardner’s quite polarizing. Some in high places see him as a rare talent. A few that knew him early on think he’s merely a product of Kosinski’s creativity, and that he’ll vanish in any other realm. P. Sellers and others have emulated Chauncey Gardner’s style with some success, but its Gardender commitment to film and how he hits the books that make him stand out. when asked about playing in the NFL, Gardner replied he’ll be happy just being there. I read that too. He likes philosophical answers, though I think he’d prefer places with defined seasons. I hear with the proper substrate, there can be growth and development, He also probably thinks cutting out the dead wood is very important. Glad he likes to watch. They should show him Ronnie Lott highlights. I heard he speaks eight languages. Thanks Brodie, Chauncey Gardner-Johnson is my favorite all-around Safety in this class, and I like his fit at FS in Saleh’s scheme. I’ve had him mocked to the Niners @ #34 since before the combine, and I certainly haven’ changed my mind. While it’s a deep Safety class, the 2nd round seems to be the sweet spot for Safeties this year. I’m interest to know what the 49ers plans are for DJ Reed Jr. He had his break-out game vs the Broncos last season, recording 12 tackles, three for a loss, a sack, and a forced fumble, earning him a Pepsi Rookie of the Week nomination. He’s a bit undersized for a Safety, but he plays bigger than he measures, with his long, beefy fire hoses for arms, and he’s just fast enough to play FS in this system, IMO. He worked at both Nickleback & Safety last season, though he mostly lined up in the slot. Shanny & Saleh may be planning on committing him to FS this offseason, after signing Verrett, who has been absolutely dynamic both on the corner and in the slot when he’s healthy. I have high hopes for T. Moore after the way he finished his rookie season, as do the Niners, and I haven’t given up on Witherspoon either, so it’s going to be interesting to see how the 49ers DB depth chart shakes out during the offseason. Thanks Grant, I guess it helps to click on the link. Peter Sellers was one of my all-time favorite comedic actors, BTW. He should have won a Best Actor Award for his absolutely hilarious portrayal of Inspector Clouseau, in The Return of the Pink Panther! He’s one of those comedic actors who I find laugh out loud funny even without uttering a word, like Jim Carrey and Will Ferrell. Draft Machine is fun. The picks other teams make can seem unrealistic, but it’s still a good time. I simulate trades by playing two teams at the same time. I keep track what the actual picks were on paper. If the 49ers traded 2 for NYG’s 6+17, I note 2 was a Giants pick, 6 and 17 were Niners picks. Wonder which draft big board did you use? Maybe Jalen Jelks might be available at 104. Ferguson could fall pretty far after a fairly devastating pro day. His numbers were awful. Given that he did almost all of his damage in college playing against lower-level competition, teams could drop him way down on their boards despite his production. I have also seen him mocked into the late first round, and his sack totals are impressive. 17.5 in 2018, and 45 career sacks. He’s been mocked high, no doubt. But his pro day was almost as bad as it gets. For perspective, if he put up this performance at the combine, he would have ranked tied for 21st in the 40, tied for 11th in the bench (easily his best performance), tied for 21st in the vertical, and 17th in the broad. Those are mediocre numbers at best, but the really alarming numbers came in the agility drills. He would have been last in both the short shuttle and the three-cone drill by significant margins – for all DL, not just DEs. The slowest short shuttle by a DE at the combine was 4.78 seconds, and the slowest three-cone was 7.71 – both turned in a by a guy who is a DT/DE tweener who tested poorly. Those times are almost 0.4 seconds faster than Ferguson’s. That’s almost unbelievable. Yup, there are workout warriors who test well, and then once on the field, disappear. Then you have Ferguson, whose game film looks great, but just does not test well. Injuries and rehab can be factors, but maybe he wants to perform less than optimal, so he will fall to a playoff team. One would think he practiced beforehand, so they knew those numbers. Many would not bother to be tested, those numbers are admittedly bad. That would be a grand slam home run draft. Gotta say Grant, these breakdowns really are fantastic. You are showing you have learned a lot over the past couple of years and clearly watched a lot of film. I have definitely come away from both this and Harry’s breakdown with a better appreciation of what each guy does well and some questions regarding my initial take. With Deebo, I really hadn’t paid much attention to where he lined up, and I was probably too generous regarding his catching in traffic. With that said, I still think he is exactly what Shanahan is after from the flanker. His ability to threaten deep and get open is perfect for what Shanahan is after, and while he isn’t Harry in terms of hands and toughness in contested balls he is good enough. The reason I think Samuel is what Shanahan is after is because of his comments regarding Pettis, and how he thinks he can play all three spots. I think Shanahan wants a flanker with Samuel’s ability to threaten deep, but also handle the short and intermediate stuff and go over the middle. In fact I think he wants both his flanker and split end to have this ability. This is where I think Harry struggles, as DBs really aren’t scared of his ability to stretch the field vertically. Thanks so much, Scooter. I appreciate your comments. You may be right. My impression of Harry is he can win deep with Go Routes and Back Shoulder Fades. The latter might be his best route. Samuel can win deep with Post Routes. Good youtubes. The first and third videos are the same and done sort like Grant does his but in one video instead of 10. I think he’s trainable, he needs to learn more and will at the next level and should be a good. Probably 4th round, chance he goes late 3rd round or goes in the 5th. Very different player than St. Brown. Boykin is better put together physically. St. Brown weighed in at 214 pounds at the NFL Combine, despite being almost an inch taller, Boykin weighed in at 220 lbs. Boykin is the more physical player, much better equipped to go across the middle, Seb. Plus, Boykin has longer arms, bigger hands, runs faster, and jumps higher. Boykin seems more mature both physically and mentally as well. Seems like the kind of WR the 49ers could use, IMO. I just see 2 ND WRs, with flaws, so they are not first or second round players. He only sees flaws, lol. Who said Boykin is a first round, he’s probably not a 2nd round Sebs. Not me. 49 does, though. I see Boykin as the 16th best WR who is ranked 136th, which makes him a late 4th round pick. I have read his strengths, but also his weaknesses in the scouting reports. Equanimeous St Brown is playing in the NFL, but only caught 21 passes for 328 yards and no TDs. Maybe he will get better, but that was an inauspicious start. I do Seb? Then why do I have Boykin slated as a target for the Niners in round 4? While I could see him going round 3, I have never mocked him higher than round 4, so please Seb, pay attention, and quit making false statements! That’s because Seb is wrong a lot. 49, I meant you think he is going to be a star in the league, which most think only happens with early round players. Heh, yeah, I saw that! He’s got all the athletic traits to be very good, I will give him that. But I think the film breakdown in that article was very generous towards him. Didn’t really go through his weaknesses. What I will say is that like anybody else, if the 49ers drafted a guy with his athletic potential I would find it hard not to be excited by what could be. I don’t go on and on about many players Scooter. The only reason I’m staying on this kid is because I think he’s exactly the player the 49ers need to draft. He can separate, change direction on a dime, he’ll catch just about everything, and he’s a mismatch nightmare, something they desperately need, IMO, to complete this offense. That he was underutilized in college, could mean a golden opportunity to get a high character kid with loads of potential, and who fills a need, as late as round 4, is for me the kind of home run draft pick that builds championships. It was this game against my Cardinals which I watched live this year, when Boykin caught my attention. I thought to myself, man this kid is something. This big kid is open on nearly every play vs a pretty decent defense, catches everything in his space, and his downfield blocking is crazy strong! He does occasionally round off his cuts, and he’ll occasionally run imprecise routes, which I see with a lot of these you receivers these days, but that can be easily coached up, because he has the natural ability to sink his hips and he has very quick feet for his size, and that cannot be coached. Notre Dame Vs LSU Citrus Bowl Ending | Miles Boykin (2018) – What A Catch! To add a bit of fuel to your point, Boykin comes from a program that gets no ‘patsys’…For their high ranking, they take on the usual “bullys of every block”….their players show good discipline in their on-campus activities, as well as their off-campus pursuits…Bill Walsh always spoke of ND in the most respectful of tones in stating that their players were smart as a general rule, and dependable in the clutch…. I know you are sold on the 9ers taking a WR #2 but I still think it will be a CB or OT. I think Shanahans belief in his own ability to create yards with scheme will have the team leaning towards a defensive pick which I believe will be a CB. Could you take a look at the CB’s that will be available at pick 36 please? After that maybe the OT’s available at 36? I agree. If they just pick at their assigned spots, Garrett Bradbury(38) or Chris Lindstrom(41) may be good choices at 36. Last season, the interior O line did not grade out very well, so they need to upgrade, and counting on Garnett and re-signing Person is not enough. Tom Pelissero – Quinnen Williams dined with 49ers last night. Raiders next. Josh Allen will visit the 49ers and Lions this week. That settles it. The 49ers are taking a long snapper at pick 2.
ya’ll fools are wishlist crazy ,quit thinking with your hearts and try with the head . Kyle is keeping all his current wr’s until after the draft he may draft one good one early but focus will be area’s of need i.e. ol edge lb and db. think that way and see what your list will look like per round. Agree. Won’t look at WR until after the 2nd round, probably later. I do think Edge and another solid player on the OL like they did w/McG and Indy w/Nelson to help the passing/running game and protect JG, is most important. Then WR and all the other needs for sure. If they trade down once or twice and get 8-9 picks, that would really help. Yup. Trading back and getting multiple second round picks is the smart strategy. Nope, Niners have neglected the WR position for way too long. When was the last time the Niners found a decent WR? TO? Bill Walsh drafted Jerry Rice. Look where that took them. Niners got an EDGE- Dee Ford. Niners got a LB- Kwon Alexander. Niners got a DB- Jason Verrett. Niners got an OL- re-signing Person. Although, I still think they need to improve the O line. If the 49ers intended to wait until Round 3 or 4 to draft a WR, I imagine they would have signed someone better than Jordan Matthews. yeah yeah’ another wishful thinker and we needed those guys to start what about when they go down ? that is what the draft is for , to shore up the week areas there are plenty of wideout’s just like you said but we don’t NEED one especially not early. there are so many being talked about that just makes you want to grab one from somebody else that’s all. 9ers drafting either Samuel or Deebo. # 36 plus another 9er player (DT Arik Armstead)? C’mon Seb, we’ve all made mistakes on here before. You’re not in position to be the proof read police. Did I rip him? I thought I did it light heartedly. I was thinking the same thing. 2 TE sets who are athletic, along with everything else the 9ers can now throw at an adversary, would pretty much make guarding their offense untenable. Safeties can’t double team everybody……….. Thanks! But when it comes to Seb, I just consider the source….The blogs crASS clown! Seb……Hmmmmm? Does your ego feel better now ditch digger? GEEP, you like to dish it, but sure can’t take it. * If that’s what it takes to assuage your low self esteem SEb, then I thank you for making my day. * So Seb, tell me…..What is the requisite IQ for a ditch digger these days? Tell me yours first. Your maturity seems infantile. A mature person would note the error, correct it, and move on. that I care what you want! * I have “NOTED THE ERROR” Seb, but you’re too obtuse to take a hint. Gosh, GEEP, you asked me first, so maybe you care too much. A mature person would not be so obtrusive and smarmy. Calm down GEEP, take a deep breath and move on. crass, ditch digger, really! Thank you Jim. We need more level heads on this site. Geep, maybe you do not know this, but I am so sick of Catfish burner accounts on this site, I would never, ever, make one up. Let EVERYONE speak their piece, however mundane!!!!!!! Resist Sebninny’s attempt at fascism!!!!!!!!!!!!!!!!!!!!!!! Saw, I see right through you. You are transparent as glass, and prove my point. If you see right thru me, clever boy that you say you are, then you can see the huge sh-t eating grin I am wearing right now!! And your the one who put it there! Having said that, your fascist leanings have never worked anywhere on earth. Hmmmm, calling me names, now. I hate facism and fascists. I am for equality, with liberty and justice for all. Accusing me of being a fascist is just a fascist tactic. Thank you for exposing your own faults. Who’s this troll that thinks he knows what facism is?..and GEEP needs to take a bong hit. Thanks, Geep. I love Brown, but I don’t think the 49ers can trade up in this draft. They don’t have enough picks. They could trade down from No. 2 and pick up another first-round pick, but I would be inclined to spend that on a corner, because it’s harder to find a quality corner than a quality WR. I think the 49ers should draft a WR before a TE. WR is the weakest position group on the team. The only problem is, on the CBS big board, Deandre Baker is at 21, then the next CB is Amani Oruwariye at 47 and Rock Ya-sin at 50.I know you mocked Oruwariye, so he may be the best option at 36. There are a lot of safeties around 36. The 49ers should trade down with the Giants, acquire the 17th pick and take Deandre Baker. I think Murphy is the better fit because he’s the better zone corner. Interesting. I’ll break down both of them and learn more. Agree with you on this one Razor. Byron Murphy is the better corner for the 49ers. 3 more weeks left! Any one of those 6 players would be a big upgrade. Burns and Dillard would pique my interest at first blush, but if we stay pat and draft Bosa those two players become moot. We could still find our WR and Olinemen in rd 2-3. We seem to have a glut of young CB’s on the roster that can show up in TC. I see Lynch giving this young crop at least one more year to develop before making a big change at the position. Building the core (front 7) of the defense can make the secondary play better. Carlos Rogers and Donte Whitner were slightly better than average players before we signed them. They became ProBowl’rs when they played behind our strong core players. A strong pass rush this season is going to notably elevate the play of our DB’s. I am wondering how Joe Woods will assess the existing DBs. With all the players coming back from injury, the acquisition of Verrett, and the realization that Sherman has lost a step, the whole secondary is in flux. I could envision a secondary with Jason Verrett and Jimmy Ward as CBs, Richard Sherman as FS, and Marcell Harris as SS. Sherman would act as the captain of the secondary, getting them into the right positions and assignments. I whole heartedly agree that a strong pass rush will help the secondary. Just like a weak secondary did not allow enough time for the pass rushers to get to the QB, the Niners need to upgrade both. I am hoping that Joe Woods will help the secondary, and Kocurek will help the pass rush. If both improve, I am hoping for more sacks and more interceptions. I’m not sure just where the animus toward Arik Armstead is coming from, but AA has played for 4 seasons, …played well for his rookie season, before being injured late in the season, Played well into his 2nd season, Played with a broken hand in his third season until Shannahan pulled him off the field for repair, and in this, his fourth season led in several categories behind only Buckner in Dline stats, and led in several of those…..perhaps if we were still playing Aldon and ‘Cowboy’ there might be room for all the bitching, moaning, and bellyaching, and TRADE TALKS that I’m seeing…Until we have an adequate replacement….think before posting…. I saw the Giants are touting Eli as their QB for the next 2 years. They aint fooling nobody. They tried to move up to the number 2 spot, so they do have an interest in the number 2 pick. Why? Because they want Haskins, who threw 50 TDs last season, so in 14 games, he passed for 3.58 TDs each game. Coupled with Saquon Barkley, they could get back into the playoffs.Eli’s skills are diminishing, just like Peyton’s did. They need a QB to replace Eli, even if he sits and studies for a year. Maybe they do not want Haskins, and want Lock. The Raiders are also looking at upgrading their QB position, so the Giants need to move past the Raiders, or risk losing out. Grant wants the Giants 6th and 17th picks. I think Gettleman wants to keep that 17th pick. Giants have 12 picks, so they should use them to move up. Giants could offer their first, second and 5th round picks(6,37, 143), pus a 2020 second round pick. It would be fair to the Niners, and a good deal for the Giants. Giants have an extra 4th round pick, an 2 extra 5th round picks. Maybe the Niners should ask for a 4th round pick, and settle for a 5th round pick. The Niners could settle for lower 4th and 5th round picks. 6, 37, 132, 171. If the Giants pick 17th in 2020 it would balance out. No matter what, this would not be a fleecing of the Giants. They would get the QB they covet, and would get to keep that 17th pick. Niners, by moving back 4 spots, would get 4 additional picks, so they would also benefit greatly. The Giants might trade up with the Jets for Haskins but I believe they can get him at #6 or Haskins can even slide to Denver at #10 or they take Lock if Haskins is gone. The Giants might just take Oliver at #6 making no monster trades. Then like you said Gettleman will keep his #17 and select QB Daniel Jones. Yes, but what if the Raiders move up to select Haskins with the number 2 pick? Gruden got rid of Mack and Cooper. He will not want the last vestige of Reggie MacKenzie around. Then the Jets will see Bosa fall in their lap, so they will stand pat and take Bosa, because they do not want to do the Giants any favors. Then the Niners trade back from 4 with Denver, and Denver gets Lock, who Elway likes a lot. He will groom Lock behind Flacco, like Mahomes did with AS. Even if the Niners pick Allen or Q Williams, TB may want to select a QB, because Winston throws too many picks. If they take Jones, the Giants are out of luck. and Eli may be the QB, but maybe they will be angling for Tua or Herbert. Jones also would probably not make it past Miami or Washington. Even Cincy, Detroit and Carolina may want a QB. The Giants, by trading up with the Niners, will be assured getting the QB they covet, who can sit and learn behind Eli as the eventual successor. If they can do that without giving up 2 first round picks, that should be a good deal for them. Off topic, but Richard Madrid just posted a film room draft preview of Ohio State EDGE rusher – Nick Bosa. Per PFF, Nick Bosa has a career win rate of 24.5% (win rate being defined as the snaps where he wins his rush against the blocker in front of him to get into the back field). For perspective, the top edge rushers in a given draft are only winning 17-18% of the time, according to PFF. Also per PFF, pass rushing productivity at the college level strongly correlates to productivity at the NFL level. Among his plethora of devastating pass rush techniques, Madrid does a fantastic job of showing examples of Nick’s cross chop, swim, 2-hand swipe, wrong arm, and rip moves, to go along with his exceptional get-off, and knack for timing the snap. When it comes to stopping the run, according to PFF’s run stop percentage metric, Nick boasted a 14.3% rate, which would’ve been the highest run stopping rate among edge defenders if he had enough qualifying snaps last season, so Bosa’s fit for the 49ers is obvious … he’s a 3-down edge defender on any given series due to his exceptional ability as both a pass rusher as well as a run defender. Teams are favoring the pass more than the run on base first down plays these days, so Bosa’s immediate impact as a dominant pass rusher who is stout against the run, gives the 49ers a complimentary edge defender opposite Dee Ford. In conclusion: Nick is an edge rusher who translates speed to power, has a plethora of pass rushing moves, has the highest win rate among pass rushers since 2014, and who doesn’t really have many red flags, if any at all, outside of the durability concerns which I find to be entirely overblown. He is undoubtedly an exceptionally gifted talent at the edge position, and there is a very good chance the 49ers will take him at number two overall. In fact, Bosa should undoubtedly be the pick at number two for the 49ers if they don’t trade out of that spot, and you can take that to the bank! Of course he didn’t include Bosa’s awful reps against Oklahoma. One-sided breakdown. I’ll tell you this Grant …. unless the 49ers trade out of the #2 spot, if ShanaLynch dare to pass on Nick Bosa, if he doesn’t end up going #1 overall, and Nick comes anywhere close to living up to his projected expectations, unless the 49ers front 7 ranks at the top of the league this year, and/or they make the postseason, well …. let me just put it this way – they may as well turn off the lights at 4949 Marie P. DeBartolo Way, because the party will be over for this current 49ers regime. AND, if Bosa is bypassed by a trade back, and he becomes injured, again, the Niners will pat themselves on the back, and claim they dodged a bullet. With the Dee Ford acquisition, an EDGE is just icing on the cake. With the Rams competing in the SB, and the Seahawks making the playoffs, The Niners should be happy with an 8-8 season. To me, that would be an improvement, with playoff ambitions for 2020. Uh, they best do better than 8-8 Seb, if they pass on the consensus #1 defensive prospect who also happens to be the consensus #1 overall prospect. And if I were ShanaLynch, I certainly wouldn’t be risking my job counting on Bosa missing a bunch of time when he hadn’t missed a game over the course of his entire college career (30 straight games), prior to his injury this year. It would double their win total from last season, so that would be a major improvement. ‘Bosa had not missed a game in his entire college career PRIOR to his INJURY’. He played 3 games, then shut himself down for the rest of the season. That is kinda important. He also tore his ACL in High School. Maybe you should have said- Bosa could not stay healthy in his High School and College career, so he has major injury issues. Injuries in the NFL are hard to avoid, and he might turn out to be another Todd Shell. They already passed on Patrick Mahomes. Yah, well Patrick Mahomes wasn’t considered a sure thing, coming out of an “air raid” style offense, which is why he didn’t go in the top 5, despite the inflated value of the QB position. Bosa on the other hand, is considered about as sure of a things as there is in a draft prospect, and he will be drafted top 5, that’s a certainty. I like this mock of yours Razor, with the possible exception of Riley Ridley. While I do think Flanker may be his best position in the NFL, and he’s certainly well above average in terms of his polished route running, but I think his overall lack of athleticism, and poor downfield blocking will likely keep him off of ShanaLynch’s draft board. A trade with the Steelers could definitely work. Bosa is an absolute no-brainer. Thornhill looks like a fine fit at the Niners FS position, though I have given the edge to Gardner-Johnson, for his versatility. I had Sean Bunting in one of my earlier Niner mocks, so I really like his fit for them as well. Egbule is raw, but seems like a versatile LB, so I could get on board with him at #104. The 49ers certainly need someone to compete against Celek and Drew Sample could be that guy, and a good compliment to Kittle. I don’t know enough about Hitner, but I do know that OG/OT Keaton Sutherland, out of Texas A&M is my 2019 sleeper pick, and a great fit for the Niners scheme. Egbule would replace M. Smith at Sam, and Hitner is super intelligent and groomed to replace Richburg when the time is right…. Enlightening video. If you’re an ST doubter re his pass rush, this might change your mind. On the inside, last year he showed he can be very good. Never been a doubting Thomas. Good analysis. It is a little concerning that he is almost always a non-factor against double teams, but it was clear that when given 1-on-1 opportunities against OGs he could be a factor as a pass rusher. It definitely provides hope. I watched this George and it was quite hearting to see. I say this because if Thomas were truly a 30 percent win rate guy… he would be a top 3 interior rusher and that simply doesn’t pass the eye test. However, while saying that the video does highlight why it is too soon to give up on him as a draft pick. Same as I did with Armstead a year ago, I would argue that SF must hold on to him to see what he can become. Selling low on a young player is never a good path for improvement unless there are locker room issues. If you listen to his commentary again, I thought he did a good job of explaining how he calculated that win rate. He’s excluding double teams, and stunts, and I’m sure a few other things. He’s only really looking at ideal pass rushing situations where ST gets a one on one match up, which he described as rare. So it makes sense it doesn’t match PFFs %. Very good breakdown, I was really wondering about ST. I know they really did him an injustice forcing him to play edge. It seems like they finally understood that towards the end of the year last season. Hopefully they build on that this season, and I think they will now that they have Ford. I think this defense will make some big strides this year if we can stay relatively healthy. Should be fun to watch and hopefully Thomas has a breakout year. He shares his first name with my 6 year old, so I always have a soft spot for him and want him to succeed. With Zgonina gone, I hope Kocurek will utilize him properly. Grant, I take your point about Samuel being more of a split end than a flanker, but I can’t help but wonder if he isn’t closer to what Shanahan wants at flanker than a guy like Harry is. Samuel may not be nearly as good at contested catches as Harry, but he doesn’t have to be because he gets more open. I haven’t seen much film on Harry, or watched your review of him yet, but my sense is that he struggled to separate in the Pac-12. If that’s the case, it’s going to be worse in the NFL. He reminds me a bit of some bigger college guys who can’t separate in the NFL. Shanahan values guys who can get open quickly. He also values versatility and guys who can play multiple spots. For all that we think of Garcon as being physical and making contested catches, he has been able to get separation to make the catch throughout his career, even if he isn’t shaking loose by five yards the way Pettis routinely does. I see your point that Samuel is closer to Garcon than Harry is. But, I’m guessing Garcon typically caught at least 50 percent of his contested targets. Most good possession receivers do. Samuel caught just 37 percent of his contested targets last season. I’m guessing Pettis would be in that range. Harry has similarities with Jordan Matthews and Mohamed Sanu. All three are big guys who can play outside or in the slot and win contested targets. I find your mention of Sanu intriguing, considering Zierlein used him as a comparison for Kelvin Harmon. When can we expect his video breakdown? Mock number 12, with 2 trade backs. Niners trade back with the Giants, and in the second round with the Lions. Giants offer their first, second, 4th and 5th round picks (6, 37, 108, 143) plus a 2020 second round pick for the Niners number 2 pick. The Niners trade back in the second round with the Lions, who give their second and 4th round picks (43, 111), to move up 7 spots to get a player they covet, who will not last 7 spots. The Niners end up with pick numbers 6, 37, 43, 67, 104, 108, 111, 143, 176 and 212, along with a 2020 second round pick. 10 picks this draft. 6. Montez Sweat, (Rashan Gary or Clelin Ferrell) EDGE. Niners get an EDGE, 2 WRs, OC, S, ILB, CB, TE, OLB and OT. Dang, just read about Dakota Allen. Arrested for stealing a gun, but the charges were dropped. Sounds like he has rehabilitated his reputation, but it is a red flag. JL needs to do a lot more investigating before selecting him in the draft. Maybe instead of Allen, the Niners should select Renell Wren NT. DJ Jones needs a backup. I think it’s a red flag too. At the combine he ran a 4.77 40 so avg speed and only a 31″ vert. but he had a very fast 3 cone and 20 yd ss. A report said on Allen and two more that the home’s residents called police Jan. 6 saying they had left town Dec. 20 and returned to find their property missing, including a gun safe and guns and several stolen items according to Lubbock police documents. All three men reportedly ‘admitted’ to the break-in and theft of the weapons, according to the warrant. Allen advised investigators he and Castaneda sold the guns. All of the recovered guns were returned to the owner. So sad. Well, he has turned a page and has kept his nose clean since then. He even became team captain. Wonder if it was a one time deal, but JL should study him carefully, and not take his word like he did with Foster. I have decided I will only give you credit for any players you get correct on your final mock draft. I respect the thought process that goes into them but for me, same as on a test, if you change an answer from the correct one to an incorrect one no points are rewarded. Of course everyone will give credit or ridicule you as they see fit. Good luck. Shoup, I have said all along that my final mock will be what I use to grade my mock. I think all of my possible selections have shown a tendency. I have mocked N’Keal Harry in the second many times. I have not mocked Bosa much, and Oli Udoh is my late round O lineman. Sure, they may not be in my final mock, but I am also predicting a trade back. So far, I have done 12 mocks, and plan 4 more before the draft. The final mock will hopefully be the best one, because it will take into consideration all the changes and machinations that occur before the draft. No matter what, I can claim that I was the first one on this blog site to predict that Kyler Murray would be the first pick of the draft, despite the howls of derision. Fangio wants Miller to play at 245 instead of 235. I thought he was listed at 250 lbs. Sounds like Brian Burns and Miller have similar speed 4.53. I see Burns as a gangly (and talented) young player with a huge ceiling. As he matures, grows stronger and learns the nuances of the game he will become a perennial star. Vonn was a plug n play guy who provided immediate dividends, so he was more polished coming out then is Burns. Also, I see Josh Allen (another possible pick) as more polished then BB, but I believe that even with that, JA will need a little time to reach full football maturity. But like Burns, he will be worth the wait. For me, there are only two Dline players who can provide an immediate impact and that is Nick Bosa and QW. Like V. Miller, these guys are NFL ready. Williams will wreak havoc as an interior Dlineman and Bosa will get 7-10 sacks as a rookie. One of these players Allen, Bosa, Williams, Burns and I would add M. Sweat could be wearing the red and gold in a month. Burns bulked up to get to 249, but his playing weight seems to be similar to Miller. Looking at the game film, Burns is quick and instinctual. He also was very accomplished, unlike Gary, who is dropping because he did not have many sacks. It is kinda unfair to compare Burns to Miller, because Miller was a number 2 pick and has won a SB. Burns might last to the second half of the first round. Still, i see a lot of upside with Burns, and he could help the Niners for years. Or? If the Niners trade back, I would not mind if they picked Clelin Ferrell. He did not do much in the combine, but his game tape is solid, and his highlight film is impressive. Oliver also was impressive in his pro day. Clelin and Oliver are also good players. What I see from Clelin is a player who benefited from having one of the best Dlines in college. Ed Oliver was a one-man force. I missed it in my last post, but I would say that Oliver is very close to NFL ready. And let’s not forget Christian Wilkins who owned Alabama in the championship game. This is a draft rich year. Some very good players are going to come in waves through all 7 rds. The only thing I ask of Lynch is, don’t mess it up. Twenty two days and counting before the dust settles. I watched Ferrell in the national championship game, and he did well. If the Niners trade back multiple times, he may still be available. Yes, there is an embarrassment of riches. Niners could trade back even farther, and still get Brian Burns. Thankfully, with the acquisition of Ford, the Niners may stump us all and get Jawaan Taylor or Devin White after trading back, then get a decent EDGE rusher in the second round. I am planning 4 more mocks. One per week and my last one the day before the draft. There is another Dline player that I like (rd 2 or trade) and that is Zack Allen from Boston College. This guy is going to be a LOAD at the next level. Z. Allen is not being mentioned in the same convo with the most notable guys, but some team is going to be pleasantly surprised and very happy with this player. Jaylon Ferguson, Oshane Ximines and Charles Omenihu are also good later round possibilities. Additionally, if the Niners trade back and get a boatload of picks, Jalen Jelks, Austin Bryant, Ben Banogu and Chase Winovich should be studied and evaluated. This is stretching it a little, But am I the only one who sees Burns as a ‘lighter’ Ted Hendricks…AKA “the Mad Stork”…? It took Hendricks a couple of years in the NFL to develop into the great player he became. But its important to note that in Oakland, Hendricks was surrounded by very good players on defense. That said, you still have to be darn good player to be in the HOF. I believe that Burns will be a productive NFL player and even a pro bowler, but he will need 2-3 to fully develop. Reports had Ted Hendricks coming into the NFL at 6’7″ and 220 lbs. So, I can see a body type comparison, but Burns will need to be great at the next level to reach Hendricks sphere. Because I know how fond you were of watching the weekend games and buying AAF memorabilia (which is now worthless)…..Seb, did you see your hero, Jarryd Hayne? But, but, the stadiums were PACKED. Hayne, the guy, like the Duke Lacrosse team, who was falsely accused? You would think he would be twice as careful, since what he went through before. Guess they think he is an easy target. You would think that a young, handsome sports superstar would have no problem attracting willing attention. If he did it, may he rot in hell, but I am going to say he is innocent, until proven guilty, especially since the accuser admits it began as consensual act. Yup, I saw that on the NFL Network this morning. The AAF, aka SCL (second chance league) was viewed as a fill-in football game until the big boys started in August. Next up is the XFL which will pique some interest in the first month or so, but will also be viewed as a fill-in game until the real deal comes back around. The XFL is going to need to give us more than “He Hate Me” this time around. Cassie is going to be CRUSHED. When will they learn that these POS ..SCL.. AAF’s and XFL’s are waste of time and money. My god, even Andy Isabella, at 5′-8″ is ranked higher…..I think that punch to your face by that party patron who stole your beer affected you. See a neurologist, Plllease! No more Jarryd Hayne, Kaep, or Keelan Doss suggestions for the 49ers….I’m sure that Joan in accounting is laughing at you, as well as the 49er front office! Yes, I am a fan of Keelan Doss, and am proud of it. UCD is a world renowned innovator in agricultural technology, and the people it produces have helped change the world. People from all over the world come to study at UCD, and its vet school is a standard bearer, ranked best in the world. Guess I just think that UCD grads are exceptional.I am also a realist and had him going to the Niners with their last pick. If only given a chance, I am confident he will do well. People from all over the world come to ALL the American Universities to study! Holy Cow, Sebs, your self-love is apparent to all today!!!!! Quit being such a rah-rah!!!!!!!!!!!!!!!!!!!!!!!! You went there decades ago! move on! UCD and its agricultural expertise has developed plants that are feeding the world. UCD is world renowned, and I am not afraid to praise excellence. Even Juanhunglo has a student at Davis, I believe. UCD is ranked number 2 in the world in agriculture, only surpassed by a university in Amsterdam. Home of genetically modified plants and mammals. Incubator for Big Agra. More like a den of eugenically controlled foods and substances. Nothing like consuming a scorpion gene in your cabbage. UCD also helped develop the short stalk rice plant that prevents lodging. That plant is used to help feed the world. It also developed a tomato that can be mechanically harvested, saving many from back breaking labor. The improvements in disease control cannot be under stated. People have free will and can eat organically, if they want to. So far, how many have died from plant improvements? UCD is not intentionally going out of their way to poison people. There are strict regulations and protocols, with thorough testing. Also, the Viticulture and Oenology department has helped propel the California wine industry into its world renowned status. Actually, I had Andy Isabella going to the Pats in the first, but now have changed my mind and think they go with a TE, since Gronk retired. Isabella ran 4.31, so he would be a perfect successor to Edelman. Grant if it isn’t too much would you be able to add a written summation at the end? Sure. Will do from now on. Summary for Deebo: Probably best as a split end. Does his best work in space. Lack of success catching contested targets could be problematic at flanker. Summary for Harry: Agile after the catch, runs the flanker routes well and dominates contested targets. Looks like Larry Fitzgerald at times. Explosive. Summary for Brown: Also runs the flanker routes well and has the speed to take a slant or a hitch to the house. Has more finesse than you’d expect from someone as thick as him. I like Brown’s body language. He plays angry. An overlooked aspect of big receivers that make contested catches… keeping their feet after the catch. That’s why I favored Mike Evans over Kelvin Benjamin. Both were big and tall. Both could outmuscle DBs. But Benjamin Evans stayed on his feet after fighting with DBs for the ball. That trait pays major dividends. When the DBs go down it’s nothing but grass to the end zone. Jerry Rice had great post catch balance after contested catches. Body control, along with agility at the wide receiver position is climacteric at the NFL level. How do you guys see him? A bigger and faster version of Anquan Boldin, but John Taylor 2.0 works for me. John Taylor is 6′ 1″ 185 lbs, 4.67 forty. TO is 6′ 3″ 224 lbs, 4.45 forty. AJ Brown is 6′ 0″ 226 lbs, 4.49 forty. AB is 6′ 2.6″ 216 lbs, 4.73 forty. I’d love a Taylor 2.0, but Brown looks more like he’s from the Owens, Clark, Boldin mold. Not saying he’s going to be an Owens, Clark, Boldin but his frame and style remind me more of that kind of receiver. Kiper has been reading our intell, as he has us taking Bosa 1st and AJ 2nd. Gary has loser written all over him. I wouldn’t go near him in the first three rounds. He’s soft. Burns has a motor. He can get after it. Also has good bend. Bosa has the highest floor– you know what you’re getting. Williams might have the highest ceiling, but some of these studs from Alabama take a while to develop. After the Foster fiasco, I’d take a break from Tuscaloosa. My pick would either be Bosa, or trade back and get Burns. Burns and Allen are close to being the same player. I like Burns just slightly better. Gary is a physical freak, and can set the edge. He is also really good against the run. He played injured last season, so his toughness should not be questioned. The fact that he declined to play in the bowl game, showed that his injury was severe enough. JH also did not scheme for Gary to be a sack leader, In a new system, he will do better. I saw many teams double team him because he was the biggest defensive threat. He willingly played his role, and occupied blockers so Winovich could come in clean. Many do not like Gary, but the Niners should take a hard look at him, especially if they move back. You may not want him in the first 3 rounds, but most likely, he will go top 10. Ed Oliver is being undervalued. Not after his pro day. *Note: Captain Sensible, This mock was performed before Ed Oliver’s Houston Pro Day. The Outland Trophy is awarded to the best college football interior lineman in the United States as adjudged by the Football Writers Association of America. It is named after John H. Outland. One of only a few players ever to be named an All-American at two positions, Outland garnered consensus All-America honors in 1898 as a tackle and consensus honors as a halfback in 1899. Joshua Garnett won the Outland Trophy in 2015. Ed Oliver in 2017. Good. This means the Giants will miss out on Haskins if they do not trade up. Still think Kingsbury will want Murray, because Rosen is not good enough. Kingsbury tipped his hand Oct. 28th, and may be the reason why they hired him. Glad to see Rashan Gary and Montez Sweat in the top 10. They deserve top billing. Falcons general manager Thomas Dimitroff is known for making bold moves in the draft to secure top talents. If he is looking to trade up again, it could be for one of two potentially generational defensive line talents. Should Ed Oliver out of Houston be out of reach, then the other would be Quinnen Williams out of Alabama. Note: In Draft Insiders mock draft (above) only 7 players separate Quinnen Williams and Ed Oliver, so the 49ers have homework to do in deciding between Williams, Oliver, Allen and Sweat. Williams is a bully in the trenches who pushes offensive linemen into the quarterback on a regular basis. On film, he has multiple textbook examples from 2018 of “collapsing the pocket.” He uses exceptional leverage and violent, aggressive hands to knock his linemen back and impact plays. It’s rare for a defensive tackle to have as high of a football IQ that Williams has. He seemingly knows the offensive play call almost every time. Dan Quinn wants competitive guys who want to work on and off the field. Williams is one of them. He’s a “No Plays Off” kind of player that will inspire others with his attitude. He was never arrested or suspended for anything stupid off the field, either. To top it off, Williams worked so hard off the field that he went from being a bench player to a top five-pick over the course of a single season. Oh yeah? What about space hamsters Spiro Agnew underpants collective toaster biscuits? The San Francisco 49ers are likely looking to add to their interior linemen stocks during the 2019 NFL Draft. Garrett Bradbury, the guard from North Carolina State, has been rocketing up draft boards. Interesting to see Deebo Samuel just fell -48 on Draftek, after Grant did his analysis. He is now ranked 108. Guess others have been studying the film. Deebo is still 52nd on the CBS big board. Pertaining to other players, AJ Brown is + 21, Hakeem Butler is +45, Andre Dillard is +30, Garrett Bradbury is +59, Oshane Ximines is +52, Bobby Evans is + 56, Joe Giles- Harris is + 98, Andy Isabella is +34, Germaine Pratt is +43, Jonathan Abram is +48 and Parris Campbell is +66. There will be a lot of fluctuation and change in the rankings, with all these players moving up. I fully expect some QBs will move up, since there are so many teams that need a QB upgrade. I do not think Denver will stick with Flacco as the sole option, and likewise, Miami and Washington. Giants may be the key to unlocking the QB conundrum, but they seem to be clinging to Eli, still. Oakland may be the wild card, but they may also be in the running for Bosa, as a replacement for Mack. I expect a lot of flatulation to go along with that fluctuation. Anyone care to bet on things they think will happen in the draft? My first bet: Chris Lindstrom will be drafted before the Niners pick at 36. My first bet: Nick Bosa will be the 49ers pick at #2. I would agree, if he is there. I think there is still a chance the Cardinals take him at 1 (less than 40%). Considering he has a + 22 and is now listed at 29th in the rankings, you may be right. However, with all the QBs who will be moving up, I will take your bet. I also think many defensive linemen will be selected in the late first round. If you win, I will praise your draft acumen. If I win, I hope you will do the same to me. One compliment regarding draft acumen for whoever is right…deal. Game on. You have a strong position, because Lindstrom is the highest ranked OG, but I am counting on QB need and DL depth. Should the Niners select a WR, S, CB or OL with their second pick? They signed Jordan Matthews as a WR. They signed Jimmy Ward and Anton Exum, and Tartt and Colbert are safeties returning from injury. They signed Verrett, and have 7 other CBs, including Sherman, Witherspoon and Williams. They re-signed Person, and Joshua Garnett may be given a good chance to compete for a starting job. Of all the positions, I think the interior O line needs the most help, and at 36, the Niners could select many good O linemen. Still, the Niners did not sign an elite WR, so they may go in that direction. However, there may be some very good WRs even in the 4th round, because it is so deep in good talent, so waiting on a WR may be the best option. Therefor, an interior O lineman is my first choice. Either a Guard to compete at RG, or a Center to back up Richberg. Maybe even replace Richberg, if he gets injured again. either Chris Lindstrom or Bobby Evans at Guard, or Garrett Bradbury, Erik McCoy or Elgton Jenkins at Center. With a trade back They might get 2 options. I think N’Keal Harry WR and Erik McCoy OC would really help in the rebuild.